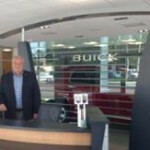 Hatfield Buick GMC has been serving the Inland Empire since 1913. That’s over 100 years! This includes Redlands, San Bernardino, Yucaipa, Highland, Beaumont, Moreno Valley, and Riverside. With an extensive selection of new and GM certified used Buick and GMC cars, trucks, and SUVs there is something to fit the fancy and needs of everyone. Hatfield Buick GMC has a no hassle and a low pressure buying experience that keeps our customers completely satisfied and coming back for generations. In fact, most of customers have bought from them before, or have been referred to us from another satisfied customer. With a company goal to exceed your expectations from test drive to delivery they look forward to providing you with not only the perfect vehicle that fits your needs, but also a vehicle at the most affordable price. The service department offers the best in automotive service to customers. The state-of-the-art facility features the most current diagnostic and repair equipment available and our highly skilled factory-trained technicians will deliver efficient, quality vehicle care. When you need service, you can make an appointment online, or call the service department. Manufacturer recommended parts are an important part of maintaining your vehicle’s performance. Hatfield Buick GMC, offers the same high quality parts your vehicle was built with and they keep a large inventory of certified parts in stock at all times. If you’d like to order a part, you can fill out the online parts form or call at (909) 748-1819. If you need financing, they have assembled a team of professionals specializing in a variety of financial solution working with many financial institutions to assist every customer with their unique credit needs. For a quick response, you can apply for credit online.